In an attempt to clear some of the blog backlog, here's an odds 'n ends post about a few places I've been to lately, with a few other photos (that I've been wanting an excuse to include on the blog) thrown in for good measure... starting with a shot of my new teapot, given to my by Mum and Dad for my birthday. 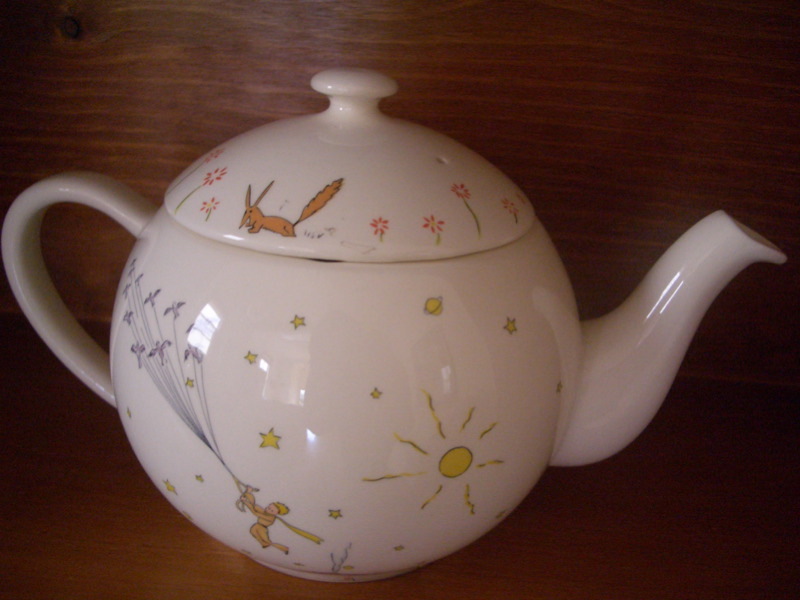 Made from fine Gien china and featuring the incomparable Petit Prince, c'est complètement adorable, n'est-ce pas? Thanks to eagle-eyed Chian who'd spotted that I originally had an incorrect address! 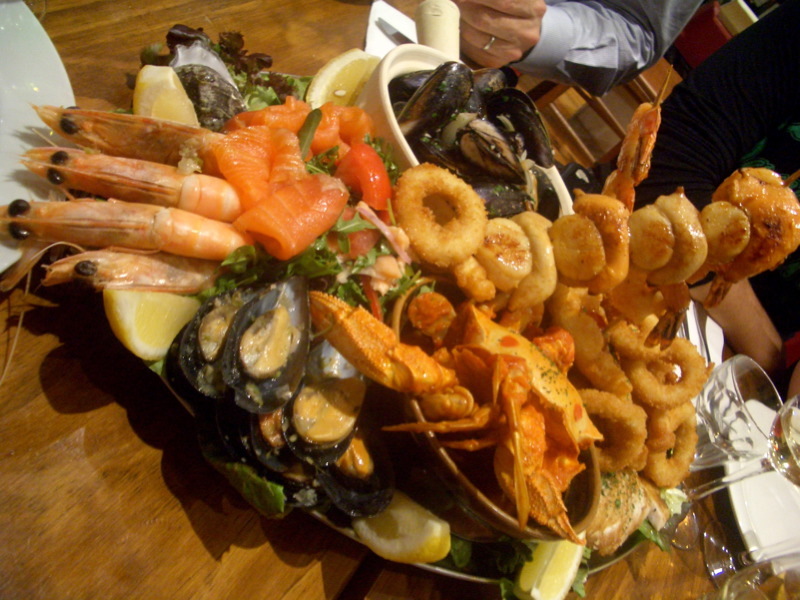 The ridiculously bountiful Seafood Platter for Two (!!) at Red Mullet, a fish caf in Glenferrie Road Malvern. It's $90 and can feed an army - having had some entrees of whitebait and salt and pepper squid, we ordered two of the platters for eight of us and were quite unable to finish them. Bloody good though - I even braved the mussels, despite my crippling fear of them (baaaaad moules-related food poisoning many years ago in Montmartre) and they were delicious! Oysters, prawns, smoked trout, steamed mussels (onion, white wine, fennel), smoked salmon, fried Blue Grenadier, grilled Trevally, steamed crab (tomato and chilli), seafood skewers of scallops and prawns, calamari rings, etc etc etc! The Don Too/Beetroot lunch combination remains as fabulous as ever. I'm thrilled to report that since I last blogged about the combo and bitched about the fact that the Beetroot staff refused to serve us at 1:45pm if we were "just" getting coffees, Beetroot has undergone a change of ownership and the lovely new guys running it are more than happy to serve us. 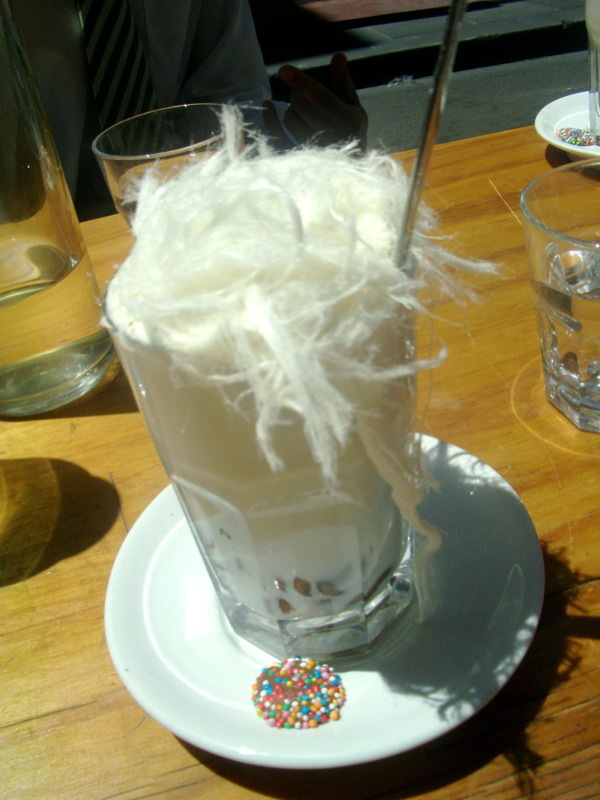 And of course, they've kept the sensational hot chocolates topped with Persian fairy floss on the menu! Don Too likewise continues to excite. 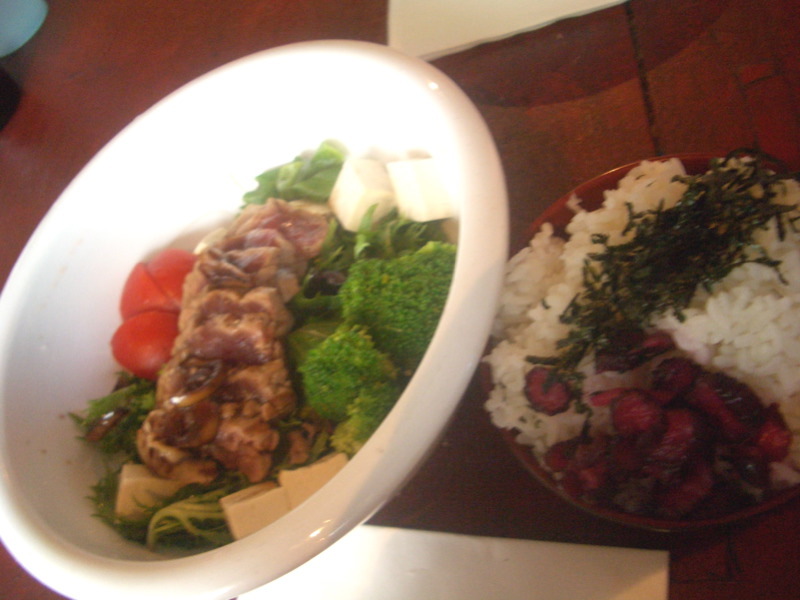 Last time I tried the Seared Tuna Steak Salad special (above), costing all of $8 and served with tofu, veggies, balsamic soy dressing and a side serve of rice and shimaya shibazuke (purple pickled cucumber that I CANNOT get enough of). Highly highly recommended! 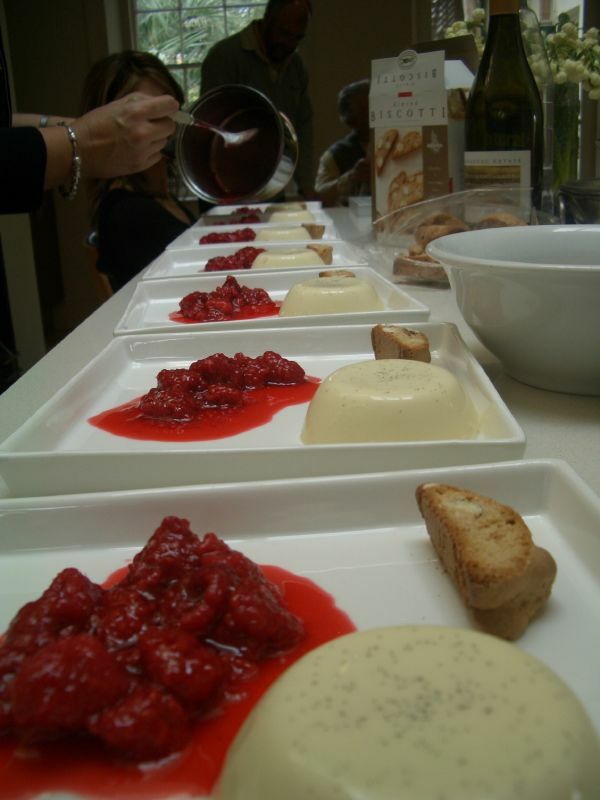 A panna cotta production line we had going at a recent family lunch with Nonna and Nonno chez Mum and Dad. On Friday I'd arranged to meet O, freshly arrived back from a trip to the UK, USA and Nicaragua, for a drink at Seamstress. While waiting in the cocktail bar for O, I bumped into Ed, who was meeting stickyfingers and the gobbler - it was quite the mini food bloggers meet-up! O and I joined the fellow bloggers and we all sampled the Seamstress tasting platter, then afterwards O and I sauntered over to the City Wine Shop for a champagne nightcap. 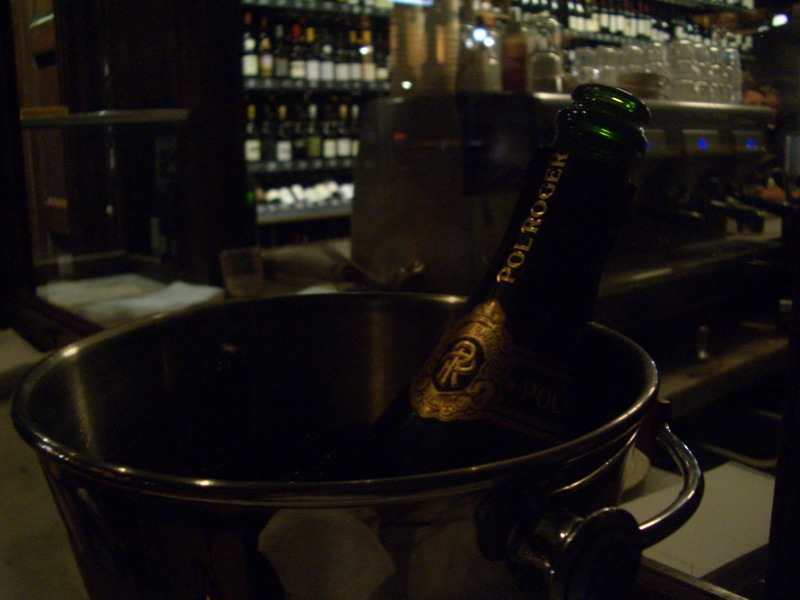 O very naughtily shouted the two of us a bottle of the 1998 Pol Roger *, which was out of this world. Drinking champagne that nice makes me regret every glass of cheap nasty bubbly I've ever drunk! The Wine Shop staff were SO lovely - when we requested the 1998 vintage and they had to phone upstairs to retrieve the last bottle, the chap serving us asked "While we're waiting for the bottle to be fetched, can I offer you a taste of something interesting and white? ", and provided us with two half glasses (a German Riesling and a Peninsula unwooded Chardonnay) on the house. Now that's service! 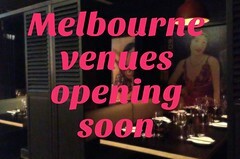 Can't wait to get a dose of their Hot Choc when I get back to Melbourne! 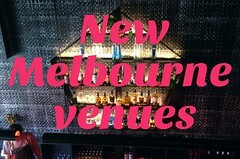 Where is this Don Too exactly? Does it have the same menu as Don Don? I checked out Seamstress after reading about it both here and on Epicure and I have to agree that it's my current favourite bar. What great service and I had a delicious delicious cocktail with pomegranate juice! P.S. the tea pot is tres cute. Where did you find it? 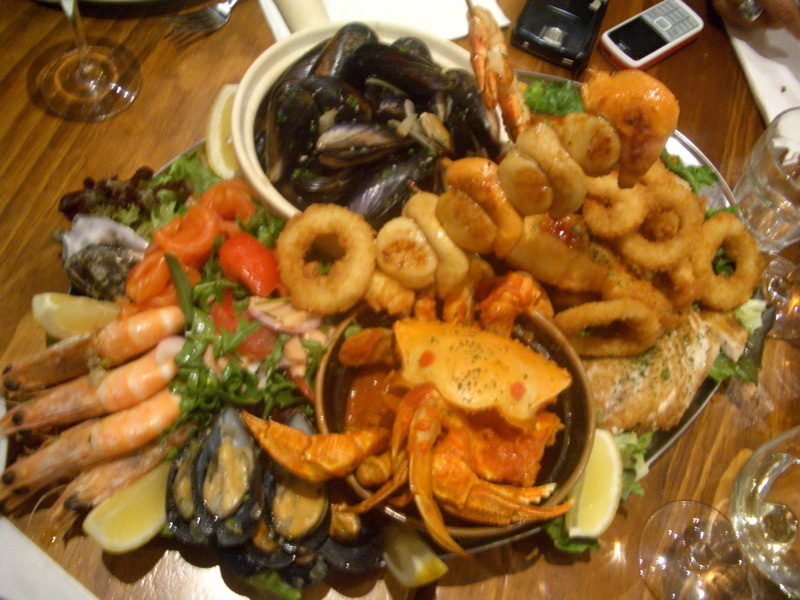 That seafood platter looks amazing! Crushedguava, the address for Don Too is written in my review (hint: just above the photo of the food from Don Too) and yes I believe the menu is almost identical. 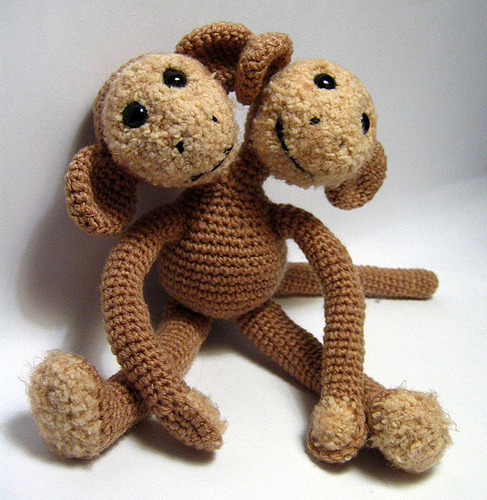 Hi Shifali, thanks so much for your kind comments! Great minds think alike, clearly. The pomegranate juice cocktail sounds brilliant, I'll have to try it next time - last year when I was in the States I went to the W Hotel and had the most amazing cocktail with pomegranate ("the Persephone Martini"), and one of my favourite non-alcoholic drinks at the moment is the Mangajo Pomegranate and Green Tea. ps. Let me know if there's anywhere else you think I should review for the blog! Hiya Cherrie Pie - the platter is well worth the $90! I have to say the teapot distracted me from much of the remainder of that post, however I very much enjoyed reading the ones above!